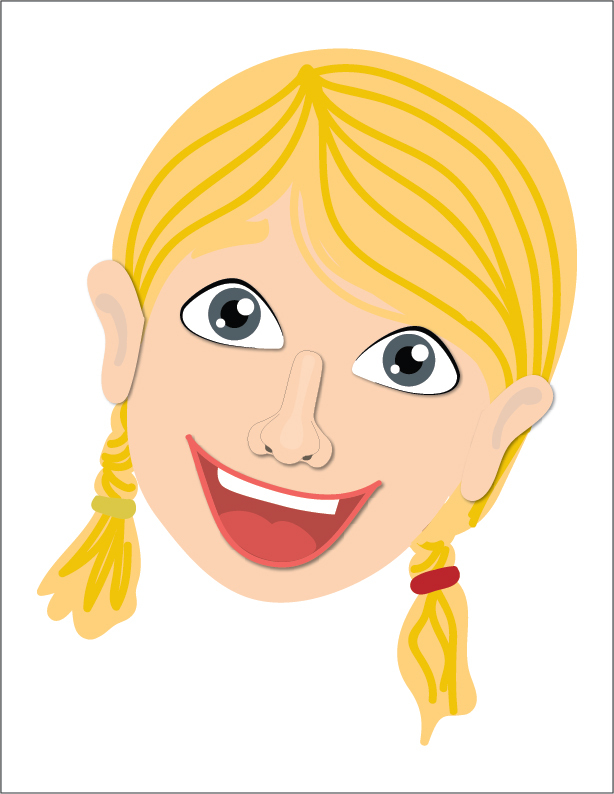 Under the section in the lesson "Additional Activities for Younger Children" is a fun activity to draw the facial features. You can use this printout for this activity! Put the page with the face on the board. Cut out the facial features and put them in a bag. Have the children take turns drawing them out of the bag and taping them to the face. As they put each feature on the face, have them tell the class one thing they can do with that body part! There is also a black and white version included if you'd like to give one to each child as a glue and color activity! This is the perfect age to teach about why we don't put certain things in our mouths! Print and cut out the cards (several of these cards come from Lesson 16. If you still have those cards, then use them again!) Put up the words "Good" "Bad" on the board. 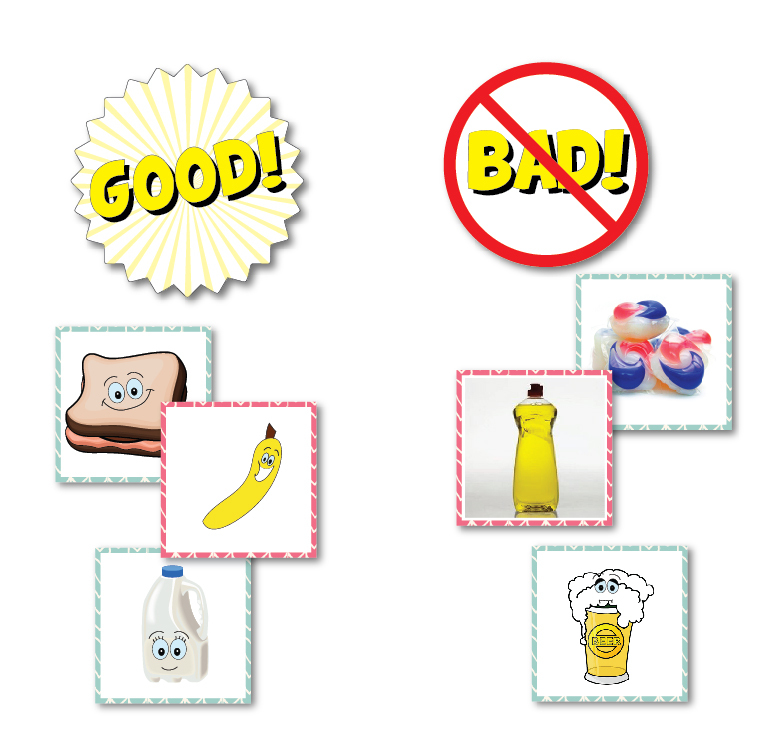 Have the children take turns drawing a card and have them place it under the "Good" or the "Bad" wordstrips. Talk to the children about why we don't put things in our mouths that aren't food or if our parents haven't told us we can. Depending on your class, you could include talking about not putting our mouths on the backs of chairs or on windows, not eating dirt or rocks, not licking our fingers or putting them in our mouths for no reason! These are things that 3 year olds will do! Fishing - add paper clips to each card and bring in your magnet fishing pole! Kids always love this game! Ball toss - lay all the cards face down on the ground spread apart. Have a child throw a small bean bag onto a card. Whichever card it lands on, have the child pick up. 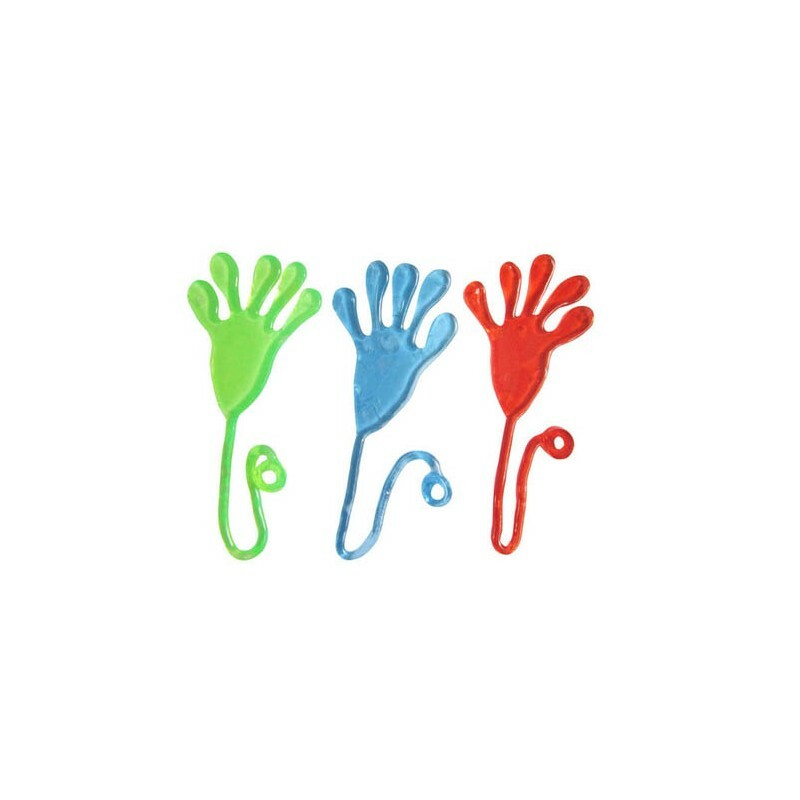 Sticky Grabber Hand - if your house is anything like my house, you'll probably have a few of these sticky toys laying around from quarter machines or school parties! Have the children pretend they are frogs and they have to "shoot" their tongue out to grab a card. Have the cards laying face down on the ground or in a basket. Whichever card their sticky grabber picks up or at least touches, that's their card to use! Ye Are The Temple Of God Coloring Page - This would be fun to have the children talk about all the different things they might be able to smell in this picture! Have the children draw a picture of their favorite food to eat. Or you could cut food images out of magazines or print some from online and let the children glue them to their "plate!" Make sure to bring in lots of different food and smelly things for the children to try. They will love doing this! Spoon game: If you have extra time, have the children play the spoon game! Bring in plastic spoons and show the children how to lick a spoon and put it on your nose. See who can keep their spoon on their nose the longest! Head, Shoulders, Knees and Toes: This is the perfect song to sing with this lesson! Change up the pace by going really slow and then going really fast. Little children LOVE doing this! When talking about taste, ask the children if any of them can do anything extra special with their tongue! Some kids can roll their tongues in different directions. Even if they can't do anything special, they all think they can when they stick out their tongues! So praise them on their cool tongue tricks! Click here to subscribe to our Primary Membership! LDS Primary 1 Sunbeams Chapter 17: "I Am Thankful for My Hands"
Primary 1 Sunbeams Lesson 16: "I Have a Body"